Elan Daley competed in the Toronto Grand Prix hosted at the University of Toronto, the 13 Year Old competed against competitors with college experience. Daley would finish the Women’s 50m Freestyle in 6th place touching the wall in a time of 27.33, Daley would finish 5th competing in the 100m Freestyle clocking time of 58.10. 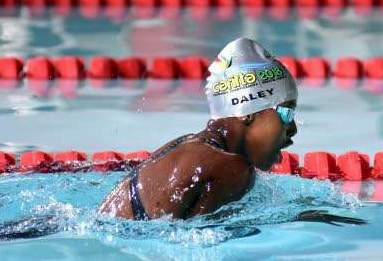 With a time of 1:10.45 saw Daley finish the 100m Backstroke in 44th place, she would finish in 30th competing in the 100m Butterfly clocking a time of 1:07.04. Daley would close out with a 22nd place finish during the 200m Individual Medley touching the wall in a time of 2:30.54.